I hope you are enjoying your summer! Unfortunately, here in British Columbia, we are in a state of emergency due to over 200 wildfires burning across the province. The current spell of dry hot weather and in some cases windy conditions is making it difficult to contain many of these fiercely burning fires. Thousands of people have been evacuated, homes burned to the ground, and communities in strife. Many of these fires have been ignited by lightning storms but there are also some every year that are the result of human carelessness…destroying thousands of hectares of pristine forest and wildlife habitat. Yesterday, while on a hike of the Diez Vistas trail in Port Moody, I was reminded of the breathtaking beauty of our forests and how easily they can be destroyed. Even leaving behind a small piece of metal or glass can ignite a wildfire, burning age old life breathing forests to the ground! So lets do our part in preventing this from happening by exercising the utmost of caution and care when enjoying the outdoors. On the positive side, it was an amazing 4.5 hour hike with incredible views once we reached the top. To make it even more enjoyable I made these delicious squares to take with us. Great food is half the fun, right?! I wanted to make something light and tasty yet with enough substance to provide energy for the strenuous activity we were going to embark on. With this in mind and the hike as my inspiration, the Trailblazer Squares were born!! Guaranteed they will be enjoyed by all! Preheat oven to 300F. 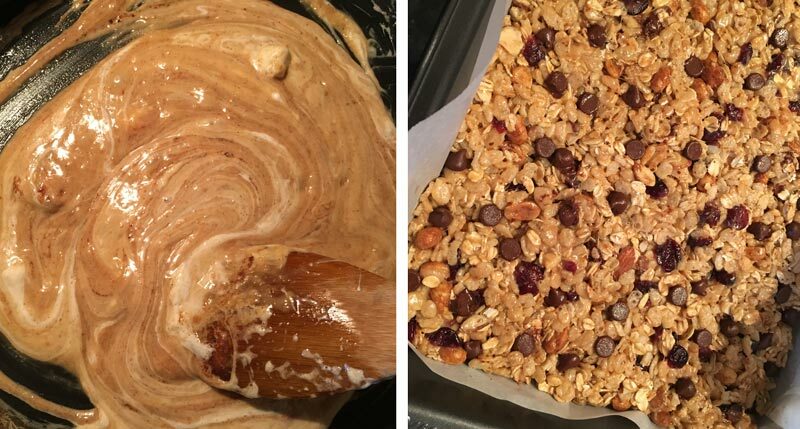 Spread oats and sliced almonds on a baking sheet. Toast for 10 minutes. Allow to cool. In a medium sized bowl mix together the Rice Krispies, toasted oats/almonds, peanuts, and cranberries. Set aside. Melt butter in a large non-stick pot on low heat. Add marshmallows, stirring until they are melted. Turn off heat. Quickly add peanut butter, honey, cinnamon, and vanilla. (see photo above, left) Turn heat back on and heat through for 2-3 minutes. Remove pot from stove. Add all of the oat/rice/nut mixture. Stir with a wooden spoon or spatula until well coated. Press mixture into a wax paper lined 13X9 inch pan. (see photo above) Scatter chocolate chips on top, press in with hands. Use buttered hands or spatula to make it even. Cut into 2-inch squares. Store in airtight container.